Bute is an archaeological and heritage paradise. It's human occupation goes back over 5,500 years as evidenced by the presence of Iron Age defence systems, numerous examples of standing stones, cists, chambered cairns, and cup markings. The island also boasts an impressive array of early Christian sites, with St Blane's Chapel (named after St Blane who was born on Bute in the 6th century) dating back to the 12th century. Bute is the ancestral home of the Stuart Kings of Scotland. Built over 800 years ago by a hereditary High Steward of Scotland named Stewart (later Stuart), Rothesay Castle, with its circular design and perimeter moat is unique in Scotland. It withstood many onslaughts including a Viking invasion, was captured by the English during the wars of independence, was retaken by Robert the Bruce in 1311, was partially destroyed in 1659 by Cromwell's troops, and was finally burned and sacked by the Duke of Argyll in 1685. Substantial restoration work has been undertaken over the past 120 odd years. In the 18th century the Stuart family moved to Mount Stuart House and estate located 7 miles to the south of Rothesay. Partially destroyed by fire in 1877, the house was rebuilt by the 3rd Marquess of Bute whose artistic, religious and astrological interests are reflected throughout this unrivalled Victorian Gothic architectural masterpiece. Mount Stuart House boasts the following technological firsts: the first house in Scotland to be lit by electricity, the first in Britain to have a heated indoor swimming pool, and a telephone cable only a year after the telephone was in vented. The legacy of this long, varied and fascinating past is a multitude of tourist attractions that cause visitors to keep coming back. 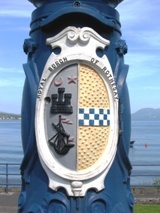 The town crest is proudly displayed on every one of the ornate Victorian lamposts that run along the seafront of the town. Initial research that's been done explains that a blue and white chequered band across a gold background represents the Great Steward of Scotland. A black galley with red flags on a white background represents the Lord of the Isles. It is assumed that the castle represents Rothesay castle, but that's just guesswork; there's a bit more research to do. Visitors: 7018 Copyright © , Bute Gateway, All Rights Reserved.